This policy statement covers essential rules that are specific to Tour du Canada and should be read in conjunction with the statement of Cycle Canada Policies and Practices. Tour du Canada policies are a condition of registration for the ride. Cycle Canada is the organizer of Tour du Canada. Riders have a right to expect that Cycle Canada and its staff will make all reasonable efforts to ensure that Tour du Canada riders complete the trip and are enriched by the cycling experience. Tour du Canada is structured as a co-operative venture. It is expected that all riders enter into that spirit. Riders are expected to be respectful of, and supportive of, fellow riders, staff and organizers. For a printable .pdf version of Tour du Canada Practices and Policies please visit: Tour du Canada Policies. The Tour starts with a full-day orientation in Vancouver. Fees include indoor accommodation on the night before the orientation. The Tour arrives in St. John’s just ahead of the Labour Day weekend. The formal end is at a farewell meal, either on the final riding day or the next morning. Completed forms required for a registration must be accompanied by a registration fee as set by Tour du Canada’s Board of Directors. Registration and deposit amounts apply towards the total fee. A deposit in an amount set by Tour du Canada’s Board of Directors is due February 1 in the year of the ride. The final amount of the fee is due by March 15 in the year of the ride. If payment is not received by the due date and if, at that time, there is a waiting list of riders wanting to register, someone on the waiting list may be given the opportunity to take that space on the Tour. Fees paid are not refundable or transferrable. Fees are to be paid in Canadian funds by cheque, money order or wire transfer. Each rider becomes a member of a galley crew to serve on meal preparation and clean-up duty on a regular rotation. Riders agree to participate willingly in these responsibilities. Tour fees include three meals a day on riding days, accommodation costs, major ferry charges and expenses associated with a support vehicle. The organizer provides galley equipment. Accommodation is mainly camping but riders stay indoors in some locations along the route. Riders bring their own bikes, tents and bedrolls. Fees are designed to make the Tour accessible to all, including those on limited budgets. We provide all the basics but this is a no-frills trip. Meal plans are high in carbohydrates and we plan as much as possible for vegetable proteins and seasonal fresh produce for a balanced diet. A portion of fees paid for the cross-Canada ride go to Tour du Canada, a non-profit corporation. That amount represents shared costs and is exempt from sales taxes (Goods and Services Tax and Harmonized Sales Tax). The balance is paid to Cycle Canada as organizer of the Tour and that amount is subject to GST and HST. Details of the fee breakdown and taxes collected will appear on receipts issued to riders. The Board of Tour du Canada recommends that prior to registering participants investigate cancellation, travel and other insurance coverage as appropriate. Prospective riders are urged to seek professional advice about insurance. We cannot make exceptions to our cancellation policy, including but not limited to personal emergencies. Cancellations must be made in writing and must come from the participant or a person legally entitled to act on the participant’s behalf. If a rider cancels, the full amount paid is not refundable. The amount allocated to Tour du Canada, which is for shared-cost expenses for the Tour, is forfeited. The amount allocated to Cycle Canada, as organizer, or a portion of that amount, less the deposit amount, may be transferred to the Tour du Canada ride in the following year at the sole discretion of Cycle Canada. It is the policy of the Board of Tour du Canada that there are no refunds for anyone who leaves the Tour while it is underway. Cancellation provisions applicable prior to the start of the Tour may be modified, at the sole discretion of the Tour du Canada Board of Directors, if there is a waiting list for participation in the Tour and someone does take a space being vacated. A waiting list as applied to the cancellation policy means after 20 riders if there is just one scheduled group and after 40 riders in two scheduled groups. Where a cancellation results in the transfer of an amount to the following year, participation will be subject to all terms and conditions applicable to that Tour year, including availability. The rider must com-plete all required application forms in a timely manner. Cycle Canada is the organizer of Tour du Canada, in consultation with the Board of Directors of Tour du Canada. Cycle Canada has a statement of practices and policies that apply to its events. Where policies of Tour du Canada are not specific, policies of Cycle Canada shall apply. The policy of Cycle Canada is that if you contact us with your name, address and any other personal information, we will not sell, rent, trade, “partner” or distribute that information to any third party, except where required by law or as authorized by the participant in the Tour. Cycle Canada expects that Tour du Canada riders will honour this policy. From time to time Cycle Canada receives queries from people who want to associate a cross-country ride with a charitable, non-profit or for-profit organization. Tour du Canada’s mission, as stated in its articles of incorporation, is to promote cycling and cycling related activities. 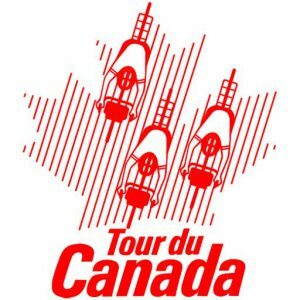 The policy of the Board of Directors of Tour du Canada is that sponsorship or fundraising activities are not permitted in connection with Tour du Canada. The co-operative nature of the ride means that participants must be fully committed to making the trip an enriched experience for all riders. Sponsorship or fundraising activities are not consistent with that co-operative concept. Tour du Canada, as an organization, does support fundraising for a Bursary Fund that is designed to assist young riders who want to participate in the Tour. Cycle Canada, the organizer, is the owner of the regis-tered trademarks Tour du Canada® and CycleCanada®. Cycle Canada reserves all rights in connection with its trademarks and copyright material. Anyone with sponsorship or fundraising goals in connection with a cross-country ride should contact Cycle Canada for further information. Tour du Canada is a rigorous event that may, on occasion, involve situations of high levels of physical or emotional stress. The organizer is aware of this potential and staff training includes discussions of how to recognize such situations. As a general rule, all that is needed is a cooling-off period. However, the organizer recognizes that there are rare circumstances of behaviour that is beyond the normal range of what is acceptable. If the conduct of an individual participant in Tour du Canada is disruptive to the group as a whole or degrading to any individual, the person responsible for such behaviour may be required to resign from the trip. In such a case there will be no refund of fees or for additional pre-paid expenses, such as travel. In the case of an incident that may fall within the purview of this provision, a review procedure will be commenced and the individual involved will be so notified. This policy statement is in effect from October 22, 2017.